Male guppies exposed to predators in the wild or in captivity have heavier brains than those living in relatively predator-free conditions, according to new research published in the journal Functional Ecology. Behavioural ecologists from Liverpool John Moores University, UK and McGill University, Canada sampled guppies from two rivers in northern Trinidad. In each river, guppies live above a waterfall, a location that only guppies and a few other small species of fish have managed to colonize, and below the fall, where many predators including pike cichlids live. The researchers looked at whether there are differences in relative brain mass between wild guppies collected from high and low predation populations and found that, for their body size, males collected from high predation sites had on average 17% heavier brains compared to males from low predation sites in the same river. Female guppies, by contrast, did not show this pattern. To test the origins of these findings, the ecologists conducted a laboratory experiment in which they exposed young guppies to cues of predation risk. “The brain is a highly malleable organ and experiences early in life can shape how it develops. 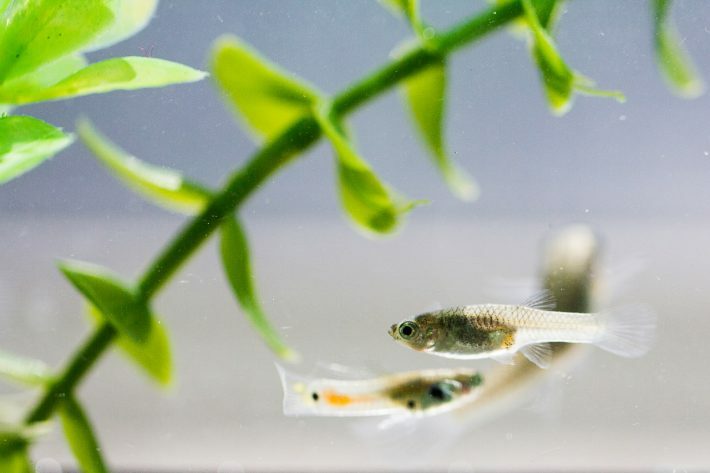 We wanted to see if the predation effect we detected in male guppies in the wild could be due to experiences in their early life stages”, commented Laura Chouinard-Thuly of McGill University, also an author on this paper. The fish were exposed to the sight of a predator living in an adjacent aquarium for five minutes at a time, five times a week during the first 45 days of their life. The researchers also added the scents of predators and an alarm cue released by guppies. Guppies in the control group were exposed to the sight and smells of a non-predatory fish. Again, the researchers found that males exposed to predator cues during development had 21% heavier brains than the control group. They found no evidence that the exposure to predation cues influenced the relative brain mass of female guppies. Males are more brightly coloured and attractive to predators. The results suggest that a larger brain for their body size is advantageous under predation threat, perhaps allowing the fish to detect, learn about or react to predators better. Brains can use a lot of energy and are generally only as big as they need to be for animal survival and reproduction. Female guppies are 2-10 times the size of males and tend to live longer. They play a slow and steady strategy to reproduction and so may consistently benefit from paying the high costs of building and maintaining larger brain tissue, whereas male guppies may only benefit under high predation risk.